Here are a few of the services we offer at a fair and reasonable cost. A will is a written instrument containing directions for how the property of the person making the will (called the testator) shall be divided on his or her death. State law generally requires that the will be signed by the testator and by at least two witnesses who have no interest in the property passing under it. The testator must state in the presence of the witnesses that the instrument is his or her will. He or she must also be "competent" (not insane, senile or mentally disabled) and not acting under duress or under the controlling influence of any person. A signed instrument purporting to be someone's will is not officially recognized until the court having jurisdiction over the instrument declares it to be a valid will after examining it and the circumstances surrounding its execution. The process by which a court determines whether a will is valid is known as probate. A person's age, marital status, and financial holdings weigh heavily into the decision to draft a will. In general, every adult should think about making a will, and the need grows as your assets and family ties increase. Wills are especially crucial for parents with children who are minors (under 18 in most states), since you can name a guardian in a will and make arrangements for financial support of children even past the age of 18. Couples also have each other to think about. If your spouse dies without a will, state law might force you to split the assets of the estate (the deceased's property) with your children, leaving you without enough assets to support yourself. Also, any property going to a minor child in such a situation would be subject to an expensive court-appointed guardianship, which could eat up any inheritance. In addition, in some states, if you were married and childless, your parents could split your property with your spouse. DOES EVERY ADULT NEED A WILLl? No. If you are single, with few assets, you probably don't need one. However, most adults should at least consider drafting a will. Even if your assets are modest, if you have minor children, you should at least execute a will in order to name guardians for them if they are left as minors with no surviving parent. DO MY CHILDREN NEED A WILL? No. Minors are not allowed to execute a will. Young, childless adults with few assets do not necessarily need wills because they may be able to hold property in joint names or to pass property automatically at death to named persons. If you die without a will, state laws determine how your property will be distributed among your heirs, or closest relatives with the right to inherit. In general, the surviving spouse gets half the estate and any children divide the other half. Grandchildren would be next in line, followed by parents, siblings, and other relatives of the deceased. If a person dies without a will and without any traceable heirs, all property goes to the state. 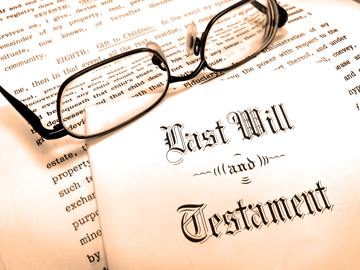 In general, after the testator (the person with the will) dies the person named in the will to carry out its terms (an "executor" or "personal representative") files the original will and other legal papers in a probate court, which is usually located in the county where the testator lived. The executor signs a petition to the probate court describing the circumstances under which the testator executed the will, naming his or her heirs (the persons who would receive the decedent's estate if there were no will), describing the property interests passing under the will, the legacies received by the beneficiaries and asking the court to admit the will to probate. Unless they specifically agree to waive notice, each of the heirs must receive formal legal notice that a document purporting to be the will has been offered for probate. The family members are given an opportunity to appear in court to object to the will; if they do not object and the probate judge finds the will in order, he generally admits it to probate and formally appoints the executor. After probate, it is usually difficult for family members to upset a will. In most states, it is possible for very small estates to be distributed through "summary administration" or "small estates" procedures. These procedures are less formal than traditional process of probate. Probate is the process by which the court approves a will and appoints an executor of the will. DOES THE WILL HAVE TO BE IN A CERTAIN FORM? In general, the will must be in writing and signed at the end by the testator. Valid wills have been executed on pieces of scrap paper. Meeting the signing and witnessing standards established by state law is more important than the appearance of a will. A will scribbled on a napkin can be admitted to probate so long as it contains all of the elements of a valid will. WHAT ARE THE ESSENTIALS TO MAKE A WILL VALID? The will must be in written form. A videotape recording of your final wishes is not valid. The person making the will must sign the will. The will must be signed by two (or, in a few states, three) competent witnesses. The person making the will must be competent, not insane, senile, or mentally disabled and not acting under duress or under the controlling influence of another person. IS A LAWYER NECESSARY FOR DRAFTING A WILL? No. Wills made without lawyers can be legally sound if the proper procedures are followed. The books and computer software on the market can guide you on issues you might want to address and on proper procedures. For people with relatively simple estates, self-help books and computer software may work fine.